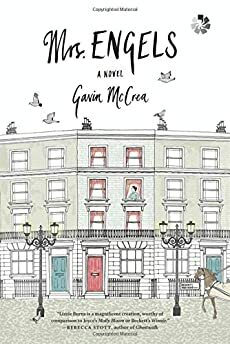 Largehearted Boy: Book Notes - Gavin McCrea "Mrs. Engels"
Book Notes - Gavin McCrea "Mrs. Engels"
Gavin McCrae's novel Mrs. Engels is a stunning debut that vividly brings Frederick Engels' common-law wife Lizzie Burns and Victorian England to life. "McCrea's richly imagined debut novel is narrated by Irishwoman Lizzie Burns, the longtime lover of The Communist Manifesto coauthor Frederick Engels. . . McCrea gives the illiterate Lizzie a vivid, convincing voice, sparkling with energy and not untouched by pathos. Her sharp, pragmatic observations offer a human perspective on historical icons (Marx has boils, while Engels is overwhelmed by letters from his mother). But the heart of the novel is the beautifully realized romance between Lizzie and Frederick: a mismatch of values and temperaments, yet also a tender and complex bond." Mrs. Engels is the story of two sisters' love for the same man. Mary, a poor mill worker, meets Frederick, the mill-owner's son, in 1842, when she is eighteen, and has a semi-clandestine relationship with him until her death some twenty years later. On account of his political views, Frederick rejects the institution of marriage. A womanizer, he is not interested in children or traditional family life. Mary enters the relationship with full knowledge of Frederick's principles and predilections. She agrees to keep their affair secret in order to protect Frederick from gossip and scandal. Yet for the duration of their relationship she harbors fantasies of the purer, more nourishing love that she believes will blossom when Frederick tires of his independent living and decides, finally, to devote himself fully and openly to her. She dies before any such change in Frederick takes place. Richard Strauss's song 'Morgen' (1894) captures Mary's longing for a final, uniting love. It also articulates the peace Mary feels when at last she understands that, beneath the suffering that attends her thoughts of a love that is never quite here, there lies the happiness of the love of tomorrow that is hers, today. Composed for a single soprano voice accompanied by orchestral strings, a solo violin, a harp and horns, and set to a text written by Strauss's contemporary, John Henry Mackay, it is a song that I play now for Mary, for when tomorrow I die. and the silence of happiness will fall on us. Mary's younger sister, Lizzie, begins a relationship with Frederick when Mary dies. Lizzie was audience to her sister's suffering during her involvement with Frederick. She gave Mary solace during her bouts of depression, and nursed her to health after her miscarriages. But she also benefited materially from Mary's relationship, and wanted it to continue, so she was not always sympathetic to her sister's expressions of dissatisfaction. Lizzie enters a relationship with Frederick with a much more practical outlook than Mary. She feels desire for Frederick, and has great affection for him, but what she longs for most is the rest that she thinks he can provide. 'What I've always wanted', she says, 'is to be able to hand myself over when I'm tired. To put down tools and know I'll not starve for it.' For Lizzie, marriage to Frederick would prevent a return to poverty; it would be permission to repose after much struggle. By the time Frederick finally agrees to marry her, however, Lizzie has understood that she needs no one's help or permission in order to find rest. Strauss's 'Beim Schlafengehen' (1948), one of the composer's 'Four Last Songs', is suffused with thankfulness for the work of the day, and acceptance of the rest that follows its end. Indeed, more than acceptance, both the text by Hermann Hesse and the music which accompanies it—again a single soprano accompanied by a full orchestra—long for and ultimately embrace the end. The song conveys the freedom and the serenity that is lived when there is nothing left to work for. It reveals the depth of experience that is true rest. It gives Lizzie peace, and thereby helps me to sleep. enfold like a tired child. long to sink themselves in slumber. it may live deeply, and a thousandfold.